A number of World Health Organization member states attended a meeting last week aimed at finding ways to sustainably finance research and development for medical products, especially those for poor populations lacking means to pay high prices. 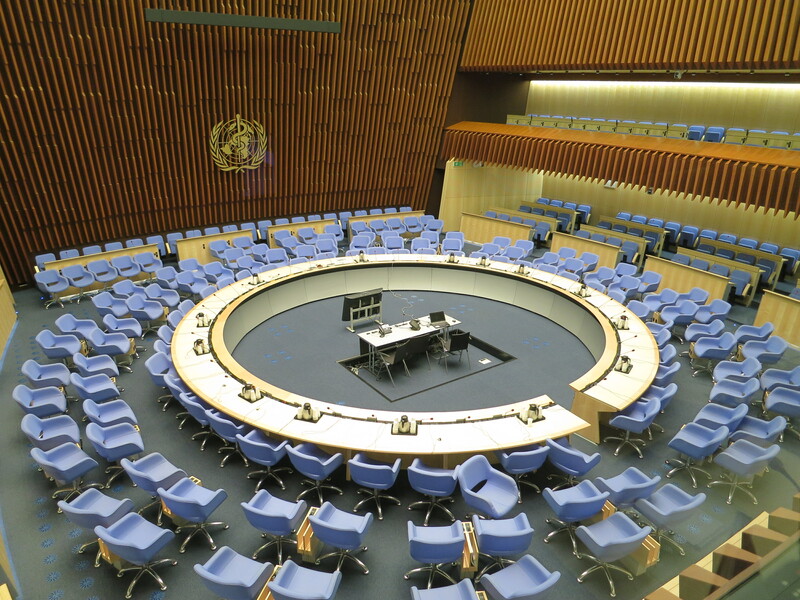 According to the outcome document and a WHO official, they heard many viewpoints from experts and made progress but much was left for the World Health Assembly later this month. The Open-Ended Meeting of Member States to Assess Progress and Continue Discussions on the Remaining Issues in Relation to Monitoring, Coordination and Financing for Health Research and Development took place from 2-4 May. The outcome report and draft decision from the meeting is available here. Sections marked yellow indicate a relative degree of agreement, according to a source, but most of the document is in brackets indicating lack of agreement so far. Member states effectively had one day for negotiations, and the draft decision grew from two pages to eight pages as it filled with proposed language. Members left the draft decision largely without agreement, and recommended to the upcoming World Health Assembly to set up a drafting group to finalise discussions on a draft decision/resolution. Some 60-70 member states attended the meeting, along with perhaps 45 NGOs and international organisations on the first two days, according to officials. It was noted by WHO staff that the draft decision so far just reflects the suggestions made by members on each point, so it is not really appropriate yet to talk about it in terms of agreement or disagreement. The remaining documents from the meeting, including a progress report and presentations on a range of issues, are on the WHO website here. Numerous health advocates and others presented views to the member states during the first two days. Some of those interventions will be captured in a subsequent story. Member states are “trying to agree on establishing a system, hopefully a global system, through which research and development can be funded and coordinated for health technology, medicines, vaccines, diagnostics,” Zafar Mirza of the WHO said afterward. This is especially the case for products that are not funded by the private sector because this research and development is for products for which there is not enough market to pay for the R&D. But “from a public health point of view, these [medicines, vaccines, diagnostics] are very, very important,” Mirza said, adding that if they are not developed, and epidemics arise, or need exists among a large number of people, and these are communicable diseases, it is a serious concern. The draft decision shows agreement on some preliminary paragraphs, but becomes bracketed almost immediately with variations on how to mention the new United Nations Sustainable Development Goals (SDGs). Later in the document, agreement appears on a request to the WHO director general to submit terms of reference and a costed workplan for the Global Observatory on Health Research and Development to the 2017 World Health Assembly. A couple of other measures on harmonisation and promotion of the Observatory also are agreed. India and Switzerland, at request of the chair, combined on some alternative text to the draft decision, to be integrated into relevant locations in the draft. Among other things, they urge member states provide sustainable funding for the Global Observatory. Lack of funding has emerged as perhaps the biggest question for the initiative, according to sources. Nations have agreed for years that there is a market failure punishing the world’s poorest, but cannot agree on how to address it. The measures discussed in this meeting are considered efforts in that direction. The meeting was called for by the 2013 World Health Assembly, the annual meeting of WHO member states, in Resolution WHA66.22. The WHO Consultative Expert Working Group on R&D: Financing and Coordination (CEWG) has been working on this issue for several years. Last week’s open-ended meeting was chaired by B.P. Sharma of India, and vice-chair was Tania Dussey-Cavassini of Switzerland. The first two days of the meeting were open to WHO observers and official non-governmental organisations. The final day was member states only. The whole event was closed to the press. The meeting was foreseen months ahead of time, but was inexplicably left to the last minute before the 69th annual World Health Assembly taking place on 23-28 May. The point of this effort is to come up with alternative ways to finance R&D into neglected diseases and other medical issues that lack sufficient private sector incentive to invest in R&D. And yet, perhaps ironically, even the demonstration projects set up to provide experiments into alternative funding themselves cannot find funding. The CEWG had come up with some clear proposals for ways forward, such as an R&D treaty, but developed countries have put up resistance. Governments seem to be to looking for a way to sustainably finance non-profit-generating health R&D in a way that does not overly threaten the existing patent-based pricing model, and does not financially commit developed country governments too much. The 22 April progress report by the secretariat (Doc A/RDMCF/2) described progress on several fronts, though lack of funding is cited throughout as a slowing factor. A Global Observatory on Health Research and Development was launched in January, and it has started collecting data. An online portal was demonstrated to last week’s meeting, and eventually the Observatory will develop analyses of gaps in health R&D, contributing to priority-setting. The Observatory is being developed by the UNICEF/UNDP/World Bank/WHO Special Programme for Research and Training in Tropical Diseases. The WHO secretariat and the Special Programme also are asked to look into the possibility of hosting a pooled fund for voluntary contributions towards R&D for diseases predominantly affecting poor populations. The Programme developed a new tool, Portfolio-to-Impact (P2I) to model the timeline and minimum funding required to develop new medicines, diagnostics and vaccines for populations with limited resources. Using this tool, the Programme set out seven implementation scenarios for a new financing mechanism and estimated how many products, either new or re-purposed, might be developed under such a mechanism, the report said. The Programme also explored options for a scientific working group to be responsible for managing the financing mechanism’s portfolio. Another area of the report was on the CEWG’s recommendation to establish a new global advisory body, the Advisory Committee on Health Research, a formal expert group with a consultative mandate to support WHO. Also significant work is being done on R&D for new antibiotics as part of the WHO’s global action plan on antimicrobial resistance. An update was also given on several “demonstration projects”, aimed at providing a lesson on what works and what doesn’t in the R&D process, which are shown to be at different levels of implementation. In her presentation to the open-ended meeting (meeting presentations are available here), Marie-Paule Kieny of the WHO highlighted innovation aspects in the demonstration projects, such as: the intent to delink the price of the final product from the cost of the R&D; utilisation of collaborative approaches including open knowledge innovation, use of licensing that secures access to research outputs and final products; testing of new financing mechanisms including innovative, sustainable and pooled funding; demonstration of coordination mechanisms; and mechanisms to strengthen capacity for research, development and production in developing countries including through technology transfer. Kieny also mentioned a March 2016 report from WHO’s Tropical Disease Research (TDR) section, entitled, Health Product R&D Fund: A Proposal for Financing and Operation. This describes how a potential pooled fund could operate under WHO with input from member states. The three areas of work would be: modelling a financial mechanism, managing an R&D portfolio, and developing a toolkit for portfolio management, she said. The progress report states that the total financial requirement of demonstration projects and establishment of the Observatory for four years (2014-2017) is US$ 85 million. Member states have been asked to contribute this but only a few have done so. The list is perhaps more notable for who is not on it, than who is. For the Observatory, France, Switzerland and the United States have given a total of less than $1 million. And to a voluntary fund for demonstration projects and Observatory, Brazil, India, Norway, South Africa and Switzerland have given a total of $7.45 million. Switzerland and Norway gave an additional $1.02 million as matching grants, and another $1.56 million was pledged, the report said. So to date, funds received have been spent, and the gap sits at $74 million by the end of 2017. The effort may be arduous, but it is worthwhile and cannot be let up, participants say. "As Patients Wait, WHO Members Chip Away At Decision On Medical R&D Funding" by Intellectual Property Watch is licensed under a Creative Commons Attribution-NonCommercial-ShareAlike 4.0 International License.